Coffee lovers, rejoice! Save 20% with our Vanilla Latte bundle, which includes our Organic Arabica Coffee & Salt Pre-Shave Scrub and our Vanilla Smiles Smooth Pre-Shave Oil. The sensual, warm aromas of coffee and vanilla come together to incite the feeling of instant comfort you experience when settling into your favorite leather chair at the local coffee shop. Made with all natural ingredients, this bundle is hypoallergenic, soothing, conditioning, and made with love in California. Want in on the shave secret that men have known for centuries? A great pre-shave oil can make the difference between a good bikini shave and an amazing one. That’s why we created Bikini Soft Smooth Shave Oil—to bring the luxury and quality of a professional shave experience to women everywhere. This exotic, nourishing scent is like a tropical vacation in a bottle. 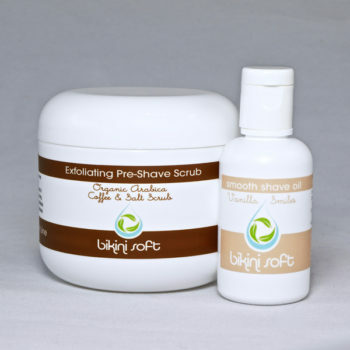 Exfoliation is the first step to getting that silky smooth feeling that puts an extra bounce in your step. Bikini Soft Citrus Bliss Organic Raw Sugar Scrub can be used alone for touchably smooth skin everywhere (even your face! 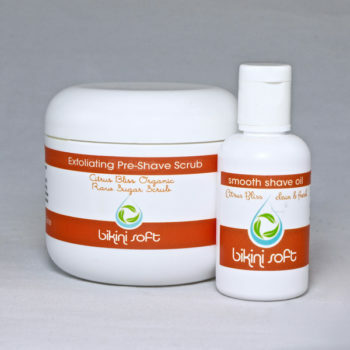 ), or for even better results, as a step 1 pre-shave scrub before our Citrus Bliss Smooth Pre-Shave Oil. The fresh, invigorating citrus fragrance—with hints of zesty orange and apricot—is like sunshine in a bottle. Made with all natural ingredients, this citrus sugar scrub is hypoallergenic, soothing, conditioning, and made with love in California. Extra sensitive skin? 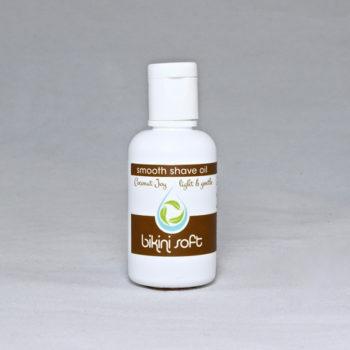 Try our Coconut Joy Pre-Shave Scrub with smaller grit. Look extra fab for beach or pool day with our cellulite-fighting Arabica Coffee and Salt Pre-Shave Scrub. The Smoothest Shave You've Ever Had.